At Eternity's Gate is far from a masterpiece, but thanks to a strong, moving performance by Willem Dafoe, it does its subject matter justice. Once again, Lionsgate has provided a solid A/V rendering of the movie on Blu-ray, and the bonus features – particularly a director's/writer's commentary track, supply insight into the production. This may not be the type of title you'll want to watch over and over, but it's certainly Worth a Look. You have to give a studio credit for even attempting a film about the life of painter Vincent van Gogh. Not to say he isn’t a fascinating person, let alone one of the greatest artists of his generation. It’s just that any filmmaker and studio knows going in that the movie probably isn’t going to be much of a financial success (indeed, At Eternity’s Gate only netted a little over $2 million domestically), but when you're able to latch onto Willem Dafoe in the starring role, you know you’re going to get a good performance. And Dafoe gives one of his best ever in this surprisingly engaging (as “art house” movies go) film. Director (who also co-wrote) Julian Schnabel doesn’t go the traditional biopic route and attempt to tell van Gogh’s entire life story. 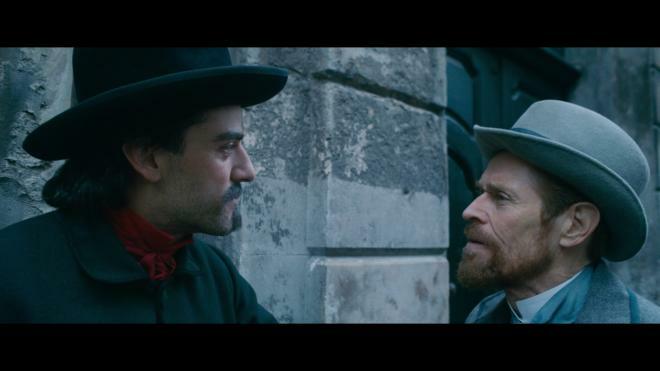 Instead, we get a tale of the artist in the final part of his life, as he meets up with fellow painter Paul Gauguin (Oscar Isaac), who tells Vincent that he admires his work and encourages him to go to the south of France for inspiration. As the movie progresses, Schnabel tries to show us through Vincent’s eyes how he gets inspired for his work. In an early scene, he takes off a pair of boots and discards them on the floor. After looking at the way they land, he rearranges them and then begins to paint one of his several famous paintings involving boots. Later, we see the way he is inspired by the natural world, painting trees, their roots, or just the landscape. But where the movie really works (and where Dafoe’s performance is really moving) is when the mental state of van Gogh is explored. Almost everyone knows van Gogh cut off his own ear, and here we get Schnabel’s interpretation of the reasons behind it (less a violent act, as history has told us, and more a cry out of loneliness). The van Gogh of this movie knows that he doesn’t think like other people and his introspection of his mental state drives the latter half of the movie. In one of my favorite scenes, van Gogh - who has self-committed himself to an asylum run by the Catholic Church - meets with a priest (played by Mads Mikkelsen) where a determination must be made if it is safe to let van Gogh be released back into society. During the conversation between the two men, van Gogh comes to the conclusion that he is similar to Jesus Christ. No, not in a divine way, but in the fact that, like Jesus, his own work will not be appreciated until long after he has left this world. Not only is this a great moment, but movie buffs may get some extra enjoyment of watching Dafoe, who is playing van Gogh, comparing himself to Christ, whom, of course, Dafoe played in Martin Scorsese’s The Last Temptation of Christ. While I didn’t fall in love with Schnabel’s film, and while it’s not something I’d probably watch a second time, I really admired Dafoe’s performance and the fact that the movie avoided the normal biographical approach that one might expect and offered a more personal look at its subject matter. 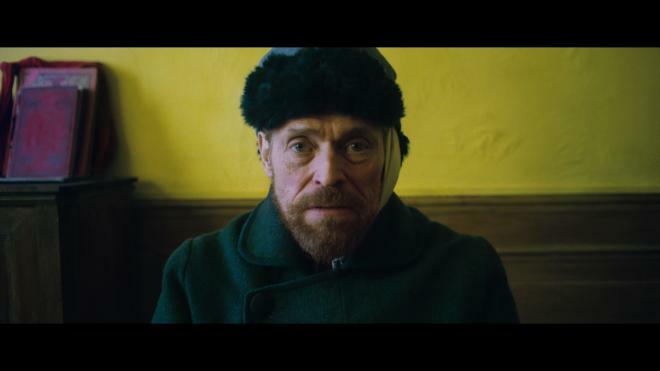 If you’re a student or just a fan of good acting, At Eternity’s Gate deserves to be seen just for Dafoe’s performance and how he engages the viewer with his words, his eyes, and his movements. 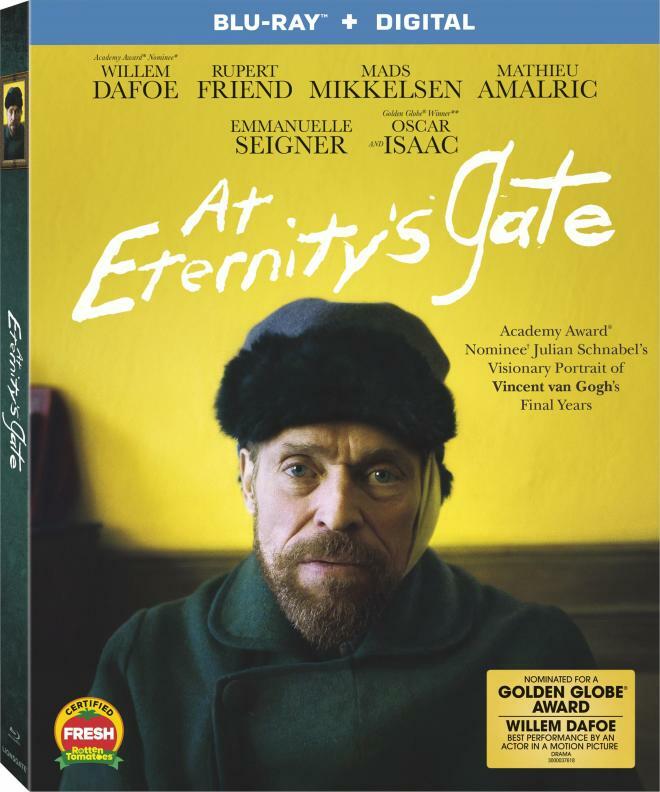 At Eternity's Gate comes to Blu-ray in an eco-friendly Elite keepcase, which houses the 50GB dual-layer disc along with a single insert containing a code for a digital copy of the film. The Blu-ray is front-loaded with trailers for Five Feet Apart and Ben is Back. The main menu features a montage of footage from the movie, with menu selections horizontally across the bottom of the screen. At Eternity's Gate was shot digitally on RED Helium 8K equipment and the 1080p transfer (shown in the 2.40:1 aspect ratio) was taken from a 4K digital intermediate. Sadly, Lionsgate has not decided to release a 4K version of the movie, but this Blu-ray version still delivers some wonderful images, from the lush green of trees to yellow-painted walls, to the variety of colors that are used in the painted works seen in the movie. The film was directed by Julian Schnabel, who is himself a painter, and he certainly gives the movie a quite artistic look. In fact, if there's any complaint I have about the visuals, it's in the way Schnabel decided to shoot his movie, other than any issues with the transfer itself. The director and cinematographer Benoît Delhomme shoot the movie primarily with hand-held shots, often giving us moments from van Gogh's perspective where the bottom half of the screen is blurred and distorted – trying to show the world as van Gogh may have seen it. In terms of artistic endeavor, it's a bold move. In terms of viewer enjoyment, honestly, it's often a distraction. But in terms of quality, the transfer here does a solid job of bringing Schnabel's vision to home video. Honestly, the movie is shot in such a way that it would be hard to pick up on glitches and know if they were transfer issues or something the director intended. Most, if not all of the scenes seem to have been shot with natural light, meaning we get a lot of sunlight and often lens flaring because of it. But to the best of my estimation, there's no noticeable aliasing or banding or problems with the image other than what the director intended to be there. The featured English 5.1 DTS-HD track, while not dominant, certainly gets the job done. Dialogue, which is exclusively front and center, is well rendered, and I didn’t notice any evident glitches such as drop-outs or muddiness in the track. The surround use, though, is subtle at best and not always obvious. It is primarily used to enhance the musical score by composer Tatiana Lisovkaia and for some ambient moments, such as for some of the outdoor sequences or when the characters are having a conversation in a crowded room. But the bottom line is that listeners/viewers should have no complaints, although the track is far from a “showy” one. In addition to the lossless 5.1 track (and the audio commentary, mentioned in our Extras section below), an English Descriptive Audio track is also available, as are subtitles in English, English SDH, and Spanish. Audio Commentary with Director Julian Schnabel and Co-Writer and Editor Louise Kugelberg – The movie's director/co-writer and its editor/co-writer team up for an informative – if somewhat dry at times (and other times silent) – commentary track. Those looking to find out why Schnabel had things look/happen the way they did in the movie will definitely want to give this a listen. Made by a Painter (HD 2:37) – This first of three featurettes on this release has the cast and crew, including Director Julian Schnabel, talking about why they chose to make the movie the way they made it. Channeling van Gogh (HD 2:16) – The cast and crew talk about how Willem Dafoe was the perfect choice to bring van Gogh to life in this film Dafoe also contributes to the conversation here. Vision of van Gogh (HD 2:09) – This final featurette takes a look at the cinematography of the movie. Theatrical Trailer (HD 2:35) – The original theatrical trailer for At Eternity's Gate. Unless you have a painting background or love the arts in general, At Eternity's Gate probably isn't something you'll wish to view more than once. 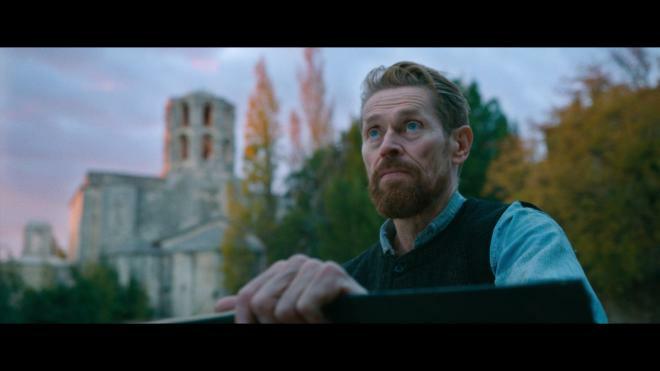 However, thanks to a strong, humanizing performance by star Willem Dafoe in the lead role, you'll leave this movie will more of a connection to Vincent van Gogh than you had going in. Lionsgate's Blu-ray release provides a nice A/V transfer and a few extras (including an informative commentary track) that, combined with the film itself, makes this one Worth a Look.